Bedsores are painful pressure ulcers that form on the body during prolonged periods of inactivity and may result in painful medical complications if left untreated. 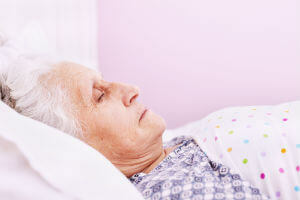 Nursing home residents who are left in an immobile state often suffer bedsores. Approximately one out of ten residents in nursing homes suffers from bedsores, according to the Centers for Disease Control and Prevention. At the Edwards Law Firm, our attorneys are committed to helping you protect your loved one from preventable injuries and medical conditions caused by nursing home abuse and neglect. If your loved one has developed bedsores or any other injury that resulted from a form of nursing home abuse, contact our team of personal injury lawyers to discuss your claim during a free, confidential consultation. Bedsores, also known as decubitus ulcers, form when a person is left in the same position for a prolonged period of time, putting pressure onto a certain area of the body. This pressure limits blood flow to the skin, which can result in tissue damage. Failure to reposition – Bedsores are likely to form when a nursing home’s staff neglects to reposition immobilized residents who are left in one position for too long. Increased or decreased skin moisture – Excessively dry or wet skin can result in bedsores forming and may worsen existing bedsores. Incontinence – A resident who is unable to control his or her bladder or bowel movements can experience pressure ulcers if the resident is left in his or her own waste. Malnutrition – Inadequate nutrition can cause a resident’s skin to break down and may also result in rapid weight loss, decreasing a resident’s muscle and fat. This will make the resident more susceptible to pressure sores, which often form where the bone is closest to the skin. Dehydration – Dehydration can also cause a resident’s skin to break down and increase the likelihood that bedsores may form. Bedsores that form on nursing home residents are often the result of inattentive staff members who neglect to provide adequate care. With proper care, bedsores can often be prevented. An immobile nursing home resident should be repositioned every 15 to 30 minutes if the resident is in a wheel chair or every two hours if he or she is in bed. Nursing home staff members and caregivers must also change the resident’s clothing on a daily basis and wash residents who have soiled themselves. It is also essential that residents are provided with the proper care to ensure their nutritional needs are met and they receive an adequate amount of liquids each day to stay hydrated. Stage one bedsores are painful and sensitive to the touch, but have not yet developed into an open wound. At this stage, the injury may appear to be a rash with red or dark skin tones where the bedsores have begun to develop. Stage two bedsores appear as open wounds that are painful and tender in the affected area. The wound may begin to expand and look like a blister, scrape or shallow crater. Once a bedsore has reached stage three, it will break through the skin into the soft tissue under it and form a small crater that may expose some fat. However, the sore has not breached muscle, tendon or bone at this stage. Stage four is the most serious classification of bedsores. Once a bedsore reaches this stage, it breaches the skin into the muscle and bone, often causing damage to deeper tissues, tendons and joints. Gangrene – This life-threatening bacterial infection produces harmful gases that release dangerous toxins in the body’s tissue around the site of the infection. Infection of the bone and joints – Infections develop from bacteria in the bedsores. These infections may damage cartilage and tissues, as well as restrict joint functions. Sepsis – Sepsis is an infection that occurs when bacteria enter the patient’s bloodstream. The infection can spread throughout the body and result in life-threatening organ failure. Cellulitis – This medical condition is an inflammation of connective tissues that causes patients to suffer meningitis, which can affect the fluid around the spinal cord and brain. Tissue damage – Later stage bedsores often cause damage to the underlying soft and deep tissue beneath the wound. Severe pain – Residents who develop bedsores suffer mild to extreme pain when they move or touch the affected site or area surrounding it. Flesh-eating bacteria – Dangerous bacteria may form at the site of bedsores that eats away at the body’s flesh. Lymph nodes or skin cell cancer – Chronic pressure ulcers can develop into a destructive form of cancer that may require surgery. Amputation – If a bedsore has caused permanent skin damage or formed a deadly infection that is likely to spread throughout the body, it may be necessary to amputate the affected area. Learn how to report nursing home abuse in this blog post. If your loved one resides in a nursing home, it is important to monitor him or her for early signs of bedsores caused by neglect. The Edwards Law Firm is committed to helping nursing home residents live with dignity and respect in the facilities entrusted with their care. We will work hold all parties accountable for failing to provide quality care to your loved one, and only get paid if we reach a favorable outcome for your case. Contact us today for a free, no-obligation case assessment.